Reacts with 35 kDa protein. Our Abpromise guarantee covers the use of ab4113 in the following tested applications. Publishing research using ab4113? Please let us know so that we can cite the reference in this datasheet. In February of 2005 we ordered and received your Ab4113, Syntaxin 3 (PO No. 639762; order no:73480). When we received it, it was aliquotted and stored at -20C. However, it is not as satisfactory as your other Abs. We have used it some 6 or 8 times, at 1:000 and 1:2000 dilutions, and in all cases we get a punctate deposit over the whole of the blot (alkaline phosphatase color reagent) and for some reason, a "smearing" across the whole blot about an inch down from the top. The bands appear, but the blots are really no good for publication because of the deposits. I would not like to dilute it further. No other of your Abs has given us this trouble. Can you suggest a fix for this or possibly replace the Ab? Thanks for your help. BTW, we like your sheep. My question regards the specificity of the antibody (ab4113) for syntaxin 3. Our primary use is immunofluorescence staining in the retina, and isoform specificity of the antibody is critical (different syntaxin isoforms mark different sets of synapses). First, is the Galli et al 1998, Mol Biol Cell, 9:1437-1448 reference the original reference for production and characterization of specificity for this particular antibody? If not, can you please tell which reference is the original description so I can check it out? Second, there is an inquiry indicating the antibody cross-reacted with several other syntaxin isoforms. Was the cross reactivity issue resolved (and how)? We get what looks to be an appropriate labeling pattern for syntaxin 3 using this antibody in adult mouse retina (diluted 1:1000, visualized with goat anti-rabbit alexaFluor488 or Goat anti-rabbit-Cy3), but we need to be sure. Mis-Identification of synapses would get us into lots of hot water. Thanks. The Galli T et al. paper is the only one that we are aware that specifically features the use of this antibody. As you have no doubt seen for correspondence with previous customers posted on the enquiries page of the online datasheet, this antibody has not been produced at Abcam or tested in our lab. However, our supplier has told us that the antibody will recognise other syntaxin isoforms in Western Blotting. (please see the discussion in the enquiry submitted on Thursday 24-June-2004). 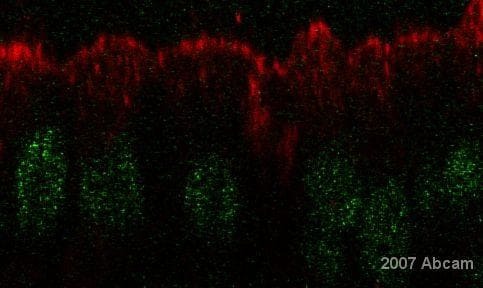 The supplier also advised that the Galli et al reference also features the use of this antibody in immunofluorescence. A suggestion would be to determine the staining pattern you find with the one observed in this publication. Is any data that shows this antibody against intracellular domain or extracellular domain or both. This antibody was raised against a fusion protein with the cytoplasmic domain of Syntaxin 3.